General Motors (GM) will be testing America’s tolerance for free trade in 2016 when it begins to import a Chinese-made Buick, the first mainstream vehicle from China that will be sold in U.S. showrooms. It’s a dicey time to introduce a Chinese import to the U.S. car market. China is a frequent target of Republican presidential candidate Donald Trump, who wants to impose new taxes on Chinese imports to help boost U.S. manufacturing. Economists dispute the merits of tariffs, yet Trump’s strong standing in the polls suggests his China-bashing has populist appeal. And some consumers still hold a grudge against GM for the 2009 government bailout that kept it in business, which could sharpen criticism of the import plan. Auto analysts have said for years that it’s inevitable cars would be imported from China. But many thought they’d be low-end econoboxes peddled to the thriftiest buyers, or Chinese-branded cars trying to undercut the competition. The Envision doesn’t fit either profile. Instead, it’s an upscale, midsized crossover meant to compete with luxury models such as the Acura RDX, Audi Q5 and BMW X3, which start at around $40,000 and can easily cost much more, with options. GM says it wasn’t even sure it would sell the Envision in the United States when it made plans to build it several years ago. 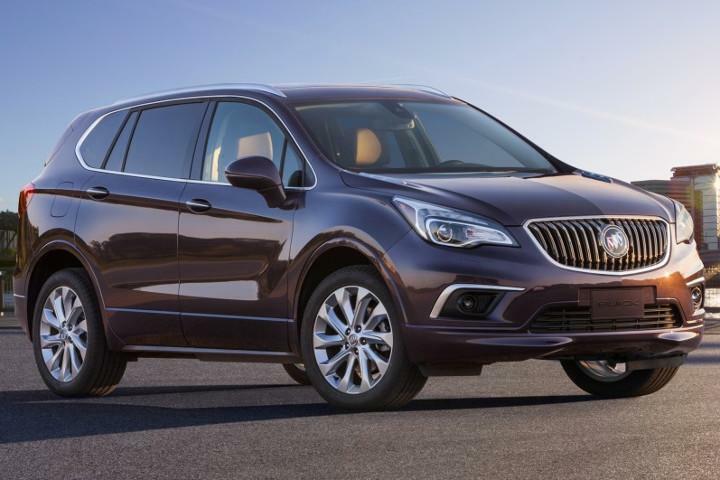 The vehicle was designed for the Chinese market, where Buick is a sales leader and GM’s top brand. Initial sales targets for the Chinese market were less than 100,000 units per year, but GM has sold nearly 150,000 since the Envision went on sale early about 12 months ago. With the market for crossovers-- raised vehicles with the ride height of an SUV but the handling of a sedan -- red hot nearly everywhere, GM decided to bring the Envision to the U.S. market. The American version will be almost identical to the one sold in China, with a few tweaks to improve handling and comply with American safety and environmental rules. The vehicle fits well in the Buick lineup, since the division has a small crossover, the Encore, and a large one, the Enclave -- but nothing in between them. GM says quality won’t be an issue. The Envision is built as part of GM’s joint venture with Chinese automaker SAIC, at a Chinese plant that meets GM’s highest internal standard for quality -- a level some of GM’s American plants don’t meet. That means fit and finish ought to be superb, with tiny gaps between seams, no misaligned cabin componenets, and no annoying squeaks or rattles. GM is borrowing talking points from Apple, as well. Executives frequently point out that while the Envision is built in China, it was completely designed in Michigan -- just as Apple says the iPhone is assembled in China but designed in California. The bet seems to be that American buyers will approve of the high-end brainwork being done at home, even if the manual labor comes from overseas. Buick hopes to sell 30,000 to 40,000 Envisions per year in the United States, a relatively modest number. If reviews are strong and sales boom, GM could start to build the crossover at a North American plant as well, since there comes a point in manufacturing where it’s more efficient to set up an assembly line where you sell the car than to bear the cost of shipping it halfway across the world. So it may be U.S. car buyers who ultimately determine if the Envision gets made in America.